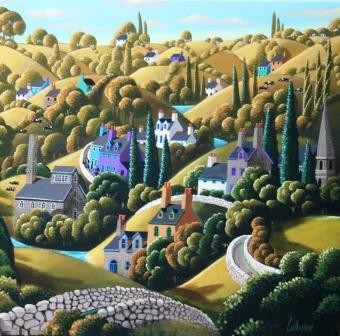 George Callaghan''s background as a designer is evident in this painting which shows his graphic style. George says: I think style is something that evolves from your own personality and life experience. It''s not something anyone can teach you. In addition to Red Rag Irish Art Gallery George Callaghan has exhibited at other leading Irish Art Galleries and many galleries overseas. Each painting at Red Rag is sourced from the George Callaghan artist studio and like all Red Rag Irish art and Contemporary art it can be shipped worldwide. Click here to view more contemporary paintings by George CALLAGHAN.